process - clouds come and go, light, shadow, and subjects move. The challenge and reward come from being able to find the key elements and ignore the unnecesaary in order to create a painting that captures the essence of the scene. Ed Hatch traces the start of his art career to age five, when he began to draw the purple martins that populated rural Petersburg Virginia, where he was born in 1954. By age 12, he was painting with watercolors, having been inspired by a Reader’s Digest article about Fenwick Landsdowne, a Canadian watercolorist. Robert Bateman’s exhibit at the Smithsonian in the 1970’s confirmed his passion to paint nature. Since then, his life has gone full circle. He now lives in his childhood home, where he has transformed the general store once owned by his great grand parents into his studio. Visually oriented, Ed sees art as a form of communication. Widely recognized for his realism in depicting wildlife, Ed paints landscapes with a classic compositional structure, as well as marine scenes incorporating traditional wooden sailboats. For the past decade he has added commission portraits to his repertoire. 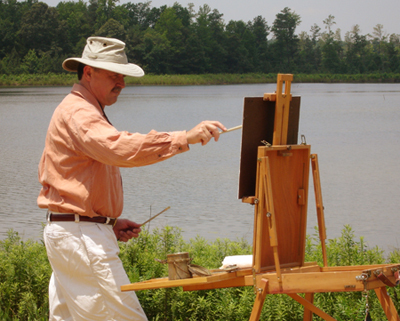 He paints his landscapes 'en plein air' - from life. "I find plein air painting exhilarating. Many things change during the painting process -- clouds come and go, light, shadow, and subjects move. The challenge and reward come from being able to find the key elements and ignore the unnecesaary in order to create a painting that captures the essence of the scene." After graduating from Old Dominion University in 1977, Ed spent three years as a commercial artist before pursuing a career as a realist painter. He received a Virginia Museum Fellowship in 1980, was nominated for the Governor’s Awards in the Arts, and received the Virginia Heritage Award from Governor Baliles. A three-time winner for Best of Show Award in the Mid-Atlantic Wildfowl Festival, he also won first place in national competition sponsored by the Association for Conservation Information. He is a member of the Oil Painters of America. Ed has exhibited widely in the Mid-Atlantic, including at the Virginia Museum of Fine Arts and the National Wildlife Federation Show in Washington, D. C. His work is included in many important collections, including Hampden-Sydney College, Ethyl Corporation, Honeywell, and the Black History Museum.